Bicyles are mighty popular in Eugene, Oregon, so it’s no surprise to find Jan VanderTuin here, the driving force behind the Center for Appropriate Transport (CAT). For non-traditional students looking for hands-on, project-based learning, CAT’s a dream come true. CAT’s got a lot going on, all at once. Step in the door and you’ll find yourself in the midst of an eclectic collection of enhanced, rentable bicycles (“the Rideable Museum”) and a self-service repair shop, with mechanics standing by to assist. Slide in a little further and you’ll likely find a half dozen teenagers welding bike and trailer frames, studying computer aided design (CAD), industrial sewing or even organic gardening—often for school credit. There’s also an unusual apprenticeship program for young adults—a five month intensive on building bike frames. Graduates can return home as skilled cargo-bike manufacturers. But wait, there’s more! 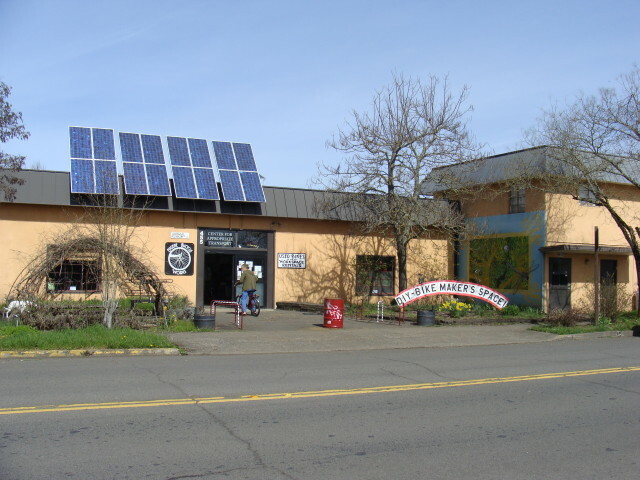 CAT offers community workshops, valet bike parking at events, wilderness bike trips, cargo bike delivery services (PedEx) and bike racks (Eugene RackWorks) as well. For students of any age looking for something off the beaten path, CAT’s worth a visit. For more on the program, visit CAT at www.catoregon.org, write them at cat@catoregon.org or give them a call at 541-344-1197 541-344-1197.